The services we offer in Canine Physiotherapy. After you have made contact with us either via email or telephone, we will take down key information from you about yourself, your dog(s) and your Veterinarian. We then make sure we have direct contact with your Veterinarian to seek Veterinary Consent for us to treat your dog prior to our appointment with you. Alternatively, your referral to us may have come directly from your Veterinarian and in which case our connections and consent will already have been arranged. Veterinary Consent is a legal requirement before we are able to treat your dog as part of the Veterinary Surgeons Act 1966. This process is a legal requirement and applies to ANY Veterinary paraprofessional who wants to treat an animal. We will establish your availability and provide you with an appointment at one of our regular canine clinics in Upton-upon-Severn, Droitwich or Kidderminster and will work around you as much as possible. Alternatively, under certain circumstances we will agree to see your dog at your home if necessary. Our Initial Assessment takes 1hr and fully investigates your dog as a whole. This is imperative if we are to identify the key areas and focus for treatment. A lot of presentations can be secondary to the original cause. Our Physiotherapists always target the cause of the problem otherwise you will find that the issues will just reoccur again and again until the root cause is dealt with. The assessment will involve the Physiotherapist observing your dog both statically and dynamically and then and a full palpatory assessment will be carried out to identify the current state of all the soft tissues, the muscles and the underlying skeletal system. At the end of this process a clear understanding of your dog's problems will be identified and a treatment plan will be made in line with ideal goals for a successful return to function. The length of time between sessions will be determined by the Physiotherapist and discussed with you along the way. The type of problem your dog may have and how your dog responds to treatment defines how many sessions they will need. You can expect 100% dedication to yourself and your dog from our team at every stage. Open communication and a commitment to you to ensure we guide you and help you through the entire process from your initial contact to our office all the way through to functional recovery. If your dog has had a Cranial Cruciate Ligament (CrCL) Injury or has suffered from a degenerative CrCL (often a secondary affect to Degenerative Joint Disease) the chances are your Vet will have undertaken a TPLO technique or an alternative surgical option but for the same reason. The aim is to achieve a stable stifle joint in your dog's hind limb. The stifle joint is anatomically the same as a human knee. It is a hinge joint with a patella in front of the joint but the difference with a dog is their hind limb has more bends to it rather than our straight leg orientation. Their stifle joint is permanently held anatomically at a 45 degree angle, this means that to repair the CrCL it has to withstand those angular forces making it harder to fix than in our own knee which being upright and in alignment there are less stresses and forces going through the limb. The method of a TPLO (Tibial Plateau Levelling Osteotomy) means the top weight-bearing part of the Tibia is cut, rotated and screwed into it's new position to make the joint more stable again in the weight-bearing position. Dependent upon how long your dog has had a CrCL condition will determine how strong their hind limb muscles were before going into surgery. As with the human body if we've been coping and walking with some discomfort for some time and have been limping as a consequence then the painful limb becomes weaker and we lose muscle bulk and strength as a result. This is exactly the same with your canine companion. After surgery your dog will undoubtedly require some help to get their hind limb muscles strong again and to help them return to their previous level of function. Again the process is just like having Physiotherapy for yourself after having knee surgery. Our Physiotherapists will assess your dog ideally pre-operatively (if their surgery is pre-planned) to provide certain basic tasks you can ask of your dog to help them improve their pre-operative strength and then continue post-operatively to assist you and your dog all the way through to a successful return to function. Our physiotherapists work on land based exercises focused on your dog's true functional environment with functional principles. We use electrotherapy such as Class 3b Laser-LLLT (Low Level Light Therapy), H-Wave, NMES (Neuro-muscular Electrical Stimulation) a very well tolerated approach to assist in muscle recovery post operatively and in certain situations Therapeutic Ultrasound. In combination with electrotherapy we use a very manual approach to relieve sore and tight muscles to allow effective recovery. We create tailored rehabilitation plans for your dog with clear functional outcomes. A Fibrocartilaginous Embolus (FCE) can occur at any time and is not said to be linked to injury. It is classed as a vascular event whereby a small part of cartilage based tissue has broken off (generally from within the spine), found its way into the vascular (blood) system and become lodged. The subsequent blockage that it causes can have far reaching neurological affects, generally affecting the hind limbs, but varies massively between different dogs. Conservative management is generally key with this condition and alongside your vet we can help assist you and your dog through this time. Recovery can occur however it can vary hugely between cases, deciding factors are unclear. The Physiotherapists in our team work with neurological principles to assist and facilitate your dog through their recovery period and aim for a return of normal function using practical principles and land based basic tasks and exercises. If your dog has required spinal surgery your dog will probably have some neurological difficulties either following injury/surgery. Our Physiotherapists work very closely alongside your vet and work slowly to achieve the maximum function that your dog can achieve at any one time. Goals are kept small but directional into constant improvement to ensure your dog continues to recover. We are a great source of information and work alongside you (often at your home in these situations) to help you adjust with the functional change and work hard with your dog to improve their functional ability week by week. Joint Dysplasia in dogs is a very common condition, the most commonly affected joints are the Elbows and the Hips. The pathology behind the condition is one whereby the bony ends which make up the joint have formed and developed with faults, this in turn means the joint has poor congruency and is therefore not as it should be. This means that there is more movement within the dog's joint than there should be, in other words 'instability'. This instability starts a progressive disease known as Degenerative Joint Disease (DJD). This instability in turn produces pain and an inflammatory response due to the excess movement causing micro trauma within the joint. This inflammation and pain causes your dog to make subtle and natural changes to their gait pattern, taking slightly less weight through that limb because it hurts! As you can imagine this very slight weight shift will mean that the painful leg is doing slightly less work meaning that this limb becomes progressively weaker and weaker as the process continues. As the limb becomes weaker it becomes more and more difficult for your dog to weight-bear on that limb because it's not strong enough to. Unfortunately, as this process continues the muscle weakness caused by the reduced weight-bearing described above results in the joint becoming more unstable. As you can see it is a viscous cycle of events which can cause long term discomfort and difficulty for some dogs. Our physiotherapists focus on stopping this cycle of events by working alongside your Vet to ensure we remove pain and then work gradually with your dog to gain more joint stability. As you can imagine this works to break the cycle of events and helps your dog to maximise their functional potential. We work at your dog's level of ability and work with you to help them improve. During a dog's overall life time a soft tissue injury is quite probable at some point, particularly if your dog competes or 'works' in any field. Just the same as ourselves, dogs can get soft tissue injuries during exercise or when they're being exerted perhaps during a competition for example. The way in which we manage them mirrors the way we would manage a soft tissue injury in human medicine. There is minimal physiological difference between dog's muscle and tendon when compared to ours and no reason to manage them any differently. The overall principles are exactly the same. Our aim is to facilitate and expedite a high quality tissue repair and quick healing times. The quality of the repair is paramount and the aim is for the dog to return to its previous level of function. Our Physiotherapists use Class 3b Laser-LLLT (low level light therapy) the superior method to aid tissue healing, plus Therapeutic Ultrasound to influence the deposition of collagen lay down during tendon healing. Physiotherapists have key knowledge to facilitate the tissue repair plus the skills to help the secondary peripherally affected tissues to return to full strength and function using stretches or exercises dependent upon the stage of recovery (Injury Rehabilitation). The process continues using treatments / advice / practical rehabilitation to provide you and your dog with the desired outcomes to go on and enjoy life! If your dog has a focal joint restriction, our aim is to work alongside your Vet to identify the reason why this may be occurring. It may be that your dog needs Veterinary intervention to assist in the management of a joint condition. As Physiotherapists we maximise function by facilitating overall strength and stability for the joint(s) in question. Muscles provide the joint with dynamic stability and if there is any joint pathology present it becomes even more paramount that the joint is stabilised during activity to ensure further deleterious effects within the joint are minimised. The weaker and more unstable a joint is the more likely it is to contract an inherent problem within the joint itself due to increased 'micro-movement' between the bony ends. This also applies when there is a pathological process already present, increased micro-movement in the presence of an existing pathology will speed the rate of further deterioration, unless the joint is rapidly stabilised effectively and then maintained. Our job as a Physiotherapist is to ensure that the joint and surrounding tissues are in good health and can stabilise the joint effectively, plus manage and eradicate the inevitable secondary and peripheral compensatory issues which are always present alongside joint stiffness/pathology. By ensuring your dog is moving as efficiently and as effectively as possible you are minimising the risk of further joint pathology and compensatory soft tissue problems from occurring. If you have a dog with a wound then we can assist with facilitating a decrease in healing times, meaning your dog is at less risk of secondary infection and complications and your dog can return to function as quickly as possible. Utilising the benefits of Class 3b Laser Therapy-LLLT (Low level Light Therapy) to speed up the healing rate is a key element of our intervention post injury. Laser works by activating the mitochondria within each cell which in turn gives the cells more 'energy' and hence why they become more 'active'. This causes an acceleration in the cell's turnover and ability to heal tissue, thereby decreasing recovery time. Physiotherapy also looks at the whole dog and tackles the inevitable secondary compensations which will have undoubtedly occurred as a result of the initial injury which caused the wound in the first place or those which are secondary to being less active during the period of wound healing. A Personal Service which Targets both the dogs and their owners Physiotherapy needs! We are some of the most qualified Physiotherapists in the UK, extensively trained and governed by the Chartered Society of Physiotherapy (CSP) we offer the highest qualified Chartered Veterinary Physiotherapists the UK has to offer. Our approach is specifically tailored to your requirements and your dog's needs and all our treatments and advice are based and focused upon mutually agreed, realistic goals specifically for you targeted on your desired outcomes at the end of treatment. Our Initial Assessment and Treatment sessions last 60mins and during this time your entire dog is assessed both dynamically and statically, your dog is looked at in varying gaits in different positions and a problem list is identified. Following this you are informed of all the findings from our assessment and an initial treatment is completed following your consent. Alternatively, if we feel more appropriate, we may advise you seek further Veterinary input at this stage if we feel that this is necessary before we undertake any treatment. We provide both yourself and your dog with the most up to date and current treatment approaches available. We are governed by strict health guidelines and follow a human medical research structure, therefore we have regular access to the most current and up to date evidence based approaches there are available. We are completely unique as a profession, being Chartered Physiotherapists mean we are all Human Physiotherapists who have completed our Masters of Science qualifications (MSc) this means we can offer you the very best both human medical Physiotherapy and Veterinary Physiotherapy has to offer. We are the one and only profession that has the unique and fantastic set of skills which can assess and treat both yourself and your dog! 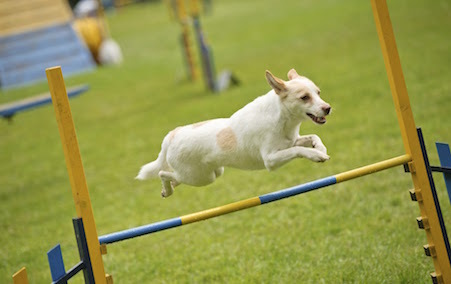 So if you're struggling to run alongside your dog in the parade ring or during an agility class we can help you! We work very closely with many different Vets and other professionals which means we can offer you the very best information and advice. We intermittently join forces with other specialists and experts to learn from one another and share a common desire to move Veterinary Medicine forwards. We also run regular seminars/evening talks to give you the opportunity to come along and learn and furnish you with the best information there is! Improved Strength and Flexibility in Movement for both you and your dog. Physiotherapy provides your dog or yourself with the necessary tools to become more flexible through all movements and this in turn enables an increase in strength and ability. The quality of movement not only is important in competitive disciplines but is also vitally important to reduce the incidence of injury. The greater the quality and efficiency of movement then the likelihood of injury is massively reduced. If you or your dog are moving in the best possible way, then it's not difficult to imagine that if you move well then you're far less likely to put both spinal structures and soft tissues under strain. Our Physiotherapists focus on both the skeletal and soft tissue structures within the canine and human body and target treatment and advice to achieve accurate and functional muscle balance and in turn symmetry. The symmetry of movement is 'everything' in terms of movement health. 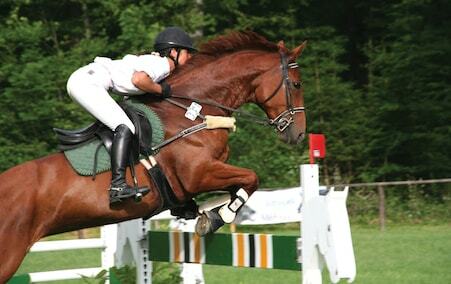 Many factors have to be finely tuned to ensure movement is as symmetrical as possible for that animal or person. The speed of recovery following an injury is key both in terms of return to competition and exercise but also to minimise the impact of secondary complications upon the body. The longer an injury of any sort is present the impact of time out, change in management, altered gait pattern or physiological cascade of events has a detrimental effect. The speed of recovery plus resolving associated and peripheral issues is paramount to ensure a high quality and speedy return to function. Our service tackles all of these issues just as we would in human medicine with a human being. Once an injury has occurred and we have managed the acute situation we then guide and advise you through the rehabilitation process. It's vital that we arm you with these skills so that you can learn how to improve your dog's movement and strength yourself. Ultimately you need to know what 'good' movement is and what is 'not so good' and how best to achieve this through graded and progressive exercises. Once you know how, we assist you at each step to progress further along the process to achieve your goals. Whether you need a little or a lot of help with rehabilitation we can help you. We provide a fully accessible service with maximum flexibility to work around yourselves. We cover a very large geographical area (entire Mid-West Region and further by arrangement) with three different clinic venues. Our physiotherapists provide verbal feedback to you whenever necessary and formal reports by arrangement. Liaison with your support team of Vet/Nutritionist/Trainer/ etc. is assured and undertaken whenever and wherever is needed to gain the very best outcome for you and your dog. Each Physiotherapist in our team is a fully qualified human Physiotherapist (Chartered) who has gone on to undertake and complete their post-graduate master's degree into Veterinary Physiotherapy. Throughout the lengthy qualification route each of our Physiotherapists have consolidated their human skills and then transferred human medical principles into the Veterinary world. Physiotherapy as a profession has long been an established part of human medicine/health care and evolved originally from treating people post injury and the rehabilitation process. Physiotherapy over recent decades has been at the forefront of human medical research and knowledge and expertise within the profession has exploded. Human Physiotherapists have complete autonomy in their field and can fully diagnose the root cause and problem and will refer on for further tests and expertise. Over recent decades human Physiotherapists have used acupuncture as a main stay to their treatment 'tool box' using both western and eastern approaches and more recently they can now undertake joint injections and prescribe medication in the human field. Because of this extremely progressive and forward thinking nature of our profession our human knowledge has, and continues to bring advancements to Veterinary medicine. Only a Chartered Veterinary Physiotherapist will give you this level of knowledge and expertise. We are here to be used as much or as little as you require. Ultimately we have the skills and knowledge to guide you through all physical goals you would like to achieve with your dog, providing advice and help along the way. Following a surgical procedure or an injury the road to recovery can be long however our Physiotherapists are here to help you to make that process as smooth and as problem free as possible. At initial assessment an outline of your ultimate goals can be set and then we will provide you with guidance/knowledge and Physiotherapeutic approaches to achieve them. At each stage we can review their progress and set more goals to ensure we are progressing in the correct direction all the way through to discharge and for longer if you require. We offer regular 'Events' and 'Talks' whereby people can come along and learn more about their dogs and we pair up with other experts in their field to bring you the most up to date information. These events have proved very popular in the past and we will continue to offer you the best information there is. We listen to you as a client and focus on what you want to hear more about so our topics vary dependent upon the requirements of our client base. Feedback from these events has shown you LOVE them and you love the social side of our events just as much as the content you're learning about! We stock some fantastic key products which we know will benefit your dog's recovery and treatment. We are always looking and are open to new products which may help support our therapeutic interventions. A fundamental role to our service is providing you with tailored advice for you and your dog. Often it becomes clear that your dog would benefit from a key piece of equipment or a product which when carried out frequently between Physio sessions would vastly accelerate their recovery. As a practice we are also Registered Distributors for Forever Living Products, an amazing and full range of products which help to boost overall health, well-being and performance. The Forever Living range of products are based upon using the whole leaf of the Aloe Vera plant which naturally is antibacterial with absolutely incredible natural healing properties. Research has shown this to be true and advocates it's use for a vast array of conditions and ailments. There are a lot of fantastic products in use within the Veterinary Field which provide arguably unrivalled health support for lots of canine ailments, just ask us for more details. We have a direct online ordering system in place, why not take a look: http://www.bradfordsphysio.myforever.biz/store.